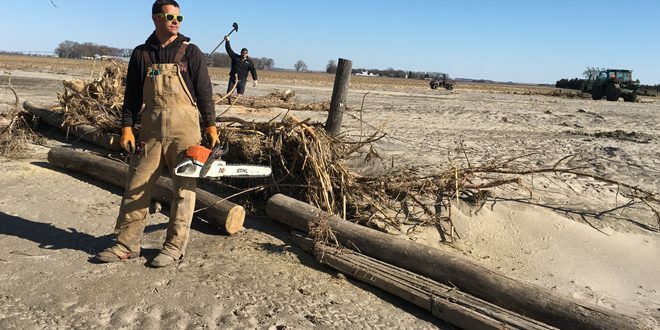 Luke Dull from Montgomery County helped cut up trees dropped in fields by the flood so they could be removed. 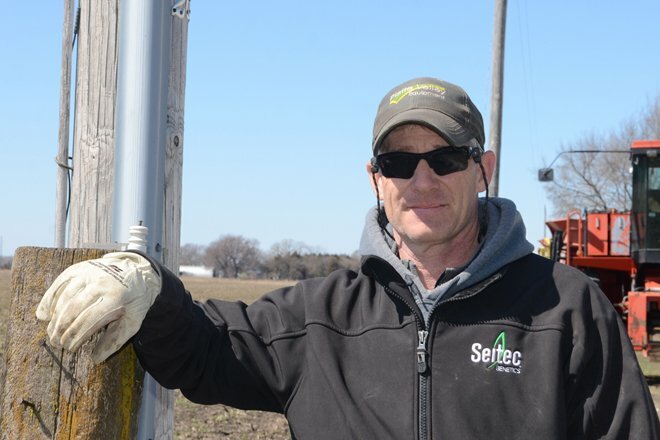 There are a number of universal truths involved with farming and one of them seems to be that farmers are quick to help, but not so quick to accept it. Sometimes, though, famers need a helping hand. Heading into March 15, many parts of Nebraska and Iowa were setting up for a disaster. In the case of the small towns of North Bend and Morris Bluff, Neb. about 50 miles northwest of Omaha, there was around 18 inches of snow on the ground that melted in a 48-hour period. The ground underneath was frozen so all of the snowmelt ran off into rivers and streams that were already flooding due to the large snowmelt further upstream. Then a couple of inches of rain fell and the combination led to extensive, devastating flooding. Small towns were plagued with terrible water quality issues as sewer systems backed up and filled basements. The surrounding farms were swamped with mountains of debris and extensive damage to assess as spring planting draws near. 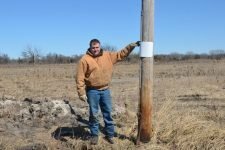 In total, 81 of the 93 counties in Nebraska are currently experiencing a state of emergency declaration with historic flooding and catastrophic losses of over $600 million. 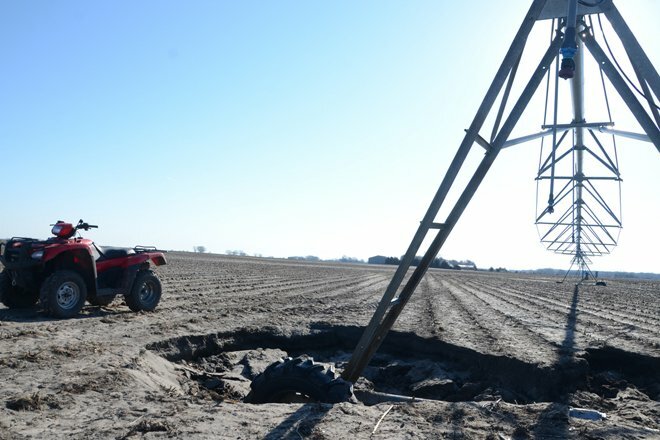 The resulting devastation left many farmers in need of some help. Tate Emanuel farms in the area with his family and was helping unload supplies brought in from Ohio volunteers on a very chilly Saturday morning on March 30. 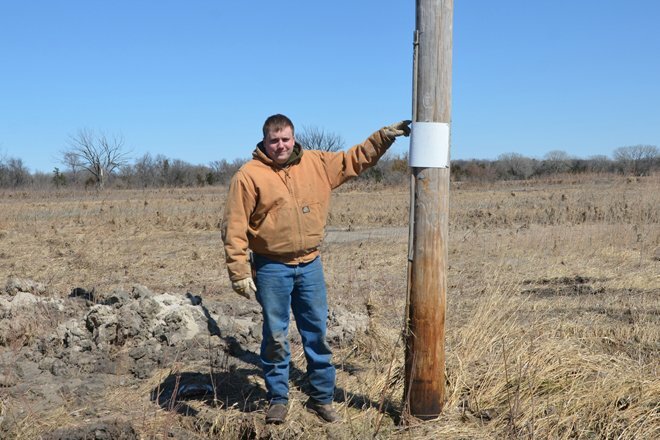 Alex Hines shows how high the water got near his farm on some of the higher ground. In the lower parts of the pasture on the Hines farm, just outside of Morris Bluff, the water got nearly 10 feet deep as it flowed through the cattle pastures. 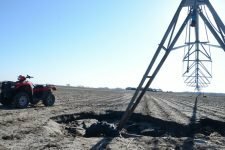 The silt from the flood piled up around and then flood water washed out the dirt around the wheels of the pivot irrigation, sinking them a couple of feet below the field’s surface. cleanup efforts getting started. 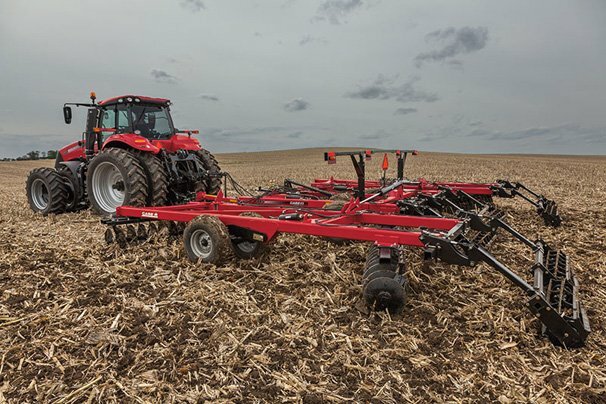 The farm produces seed and commodity corn and soybeans and beef in a cow-calf operation. Greg Beebe, Beebe Seed Farms, North Bend, Neb. The sand deposits are variable and up to around 2 feet deep in some places in the productive, 200-bushel corn fields on the Beebe farm. 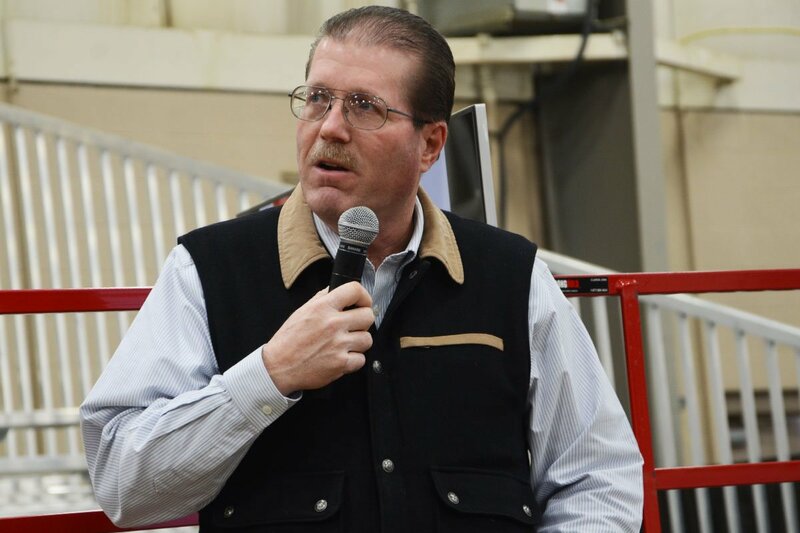 Beyond the farm, Beebe serves as a township trustee and has started to tackle the overwhelming challenges community wide. Locally the effort has been incredible with area communities rallying together to address the extensive challenges. 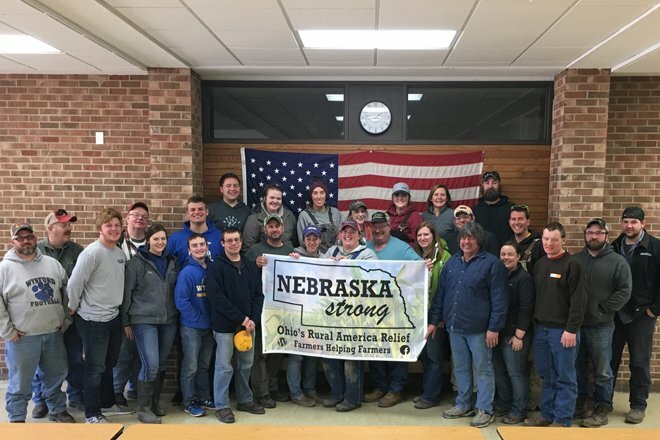 In addition, groups of volunteers from around the nation have arrived on the scene to bring needed fencing supplies, feed, hay, and other items to help farms. 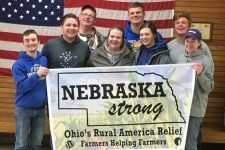 A group from Ohio, including senior members of the Wynford FFA Chapter in Crawford County, came out to help the cleanup effort on Beebe Seed Farms in late March. 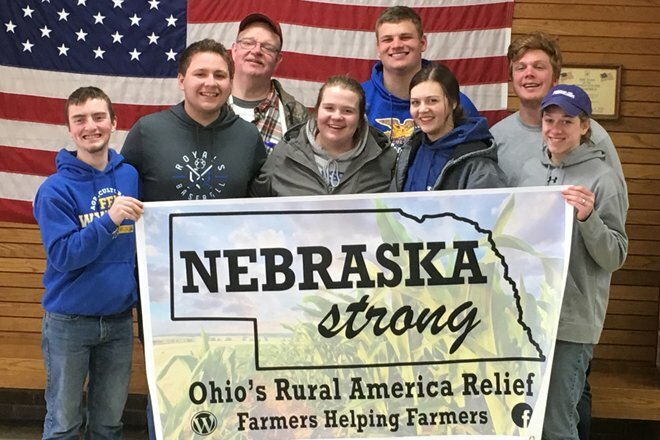 Wynford FFA members went on a trip to help in Nebraska. 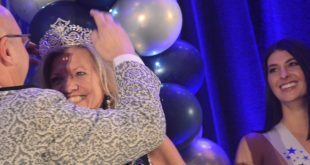 The group included Greg Hartschuh, Rose Hartschuh, Ashley Weaver, Bill Jordan, Brandie Finney, Caleb Rausch, Candace Lease, Chad Gebhardt, Derek Looker, Emily Rudd, Ethan Hall, Fred Durant, Jason Hartschuh, Jerry Holman, Joel Griffin, Kayle Roe, Kelsie Williams, Kurt Weaver, Luke Dull, Matt Dauch, Matt Reese, Matt Rudd, Nadine Miller, Ron Hurst, Sam Kline, Sara Tallmadge, Tom Miller, Tyler Miller, and Zolton Feldman. Where can a person donates quilts to be auctioned/sold to help farmers out west?